This soft, elegant, and textural arrangement is comprised of seasonal white, cream, green, and blue flowers and accents. Appropriate for many occasions, this is a great choice! Blue flowers can include hyacinth, thistle, delphinium, or hydrangea. White flowers during this season will be hydrangea, calla, lisianthus, rose, spray rose, and orchid. In the European Style we will create a beautiful, elegant hand tied bouquet in shades of purple, lavender, and green. These are carefully packaged with stems in Oasis foam, wrapped in our signature chartreuse tissue with clear cellophane, and in colder weather tucked into a kraft paper sleeve for delivery. We will always use the freshest flowers we have in the color range! Save the planet by letting the recipient use their own favorite vase. This way all of your budget goes to flowers, not more glass! Not feasible for delivery to Funeral Services, Nursing Homes, or Hospital. Ponytail Palm is a wonderful higher light, easy care houseplant! Beaucarnea recurvata is native to eastern Mexico. Despite its common name, it is not closely related to the true palms. The $52 option is a Ponytail Palm grown in a 6" diameter pot placed in a nice brown basket. 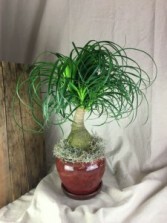 (about 18" tall) The $61 option is a Ponytail Palm plant grown in a 6" diameter pot placed in a sturdy glazed ceramic pot with a saucer. (about 18" tall) The $81 option is an 6" Ponytail Palm plant grown in a pot and placed in one of our beautiful handmade pots! A handmade saucer is included. IMPORTANT NOTE: We always have a wide selection of beautiful houseplants. However, we don't always have EVERY PLANT in EVERY SIZE! We will substitute for a similar plant unless you tell us not to! If you want to know what we have please call and we would be happy to discuss our current inventory selection. PLEASE NOTE: This unique item is only available for local delivery!